After a 6 day wait since the first leg, it's now decision time amongst the two English sides battling for a place in the Champions League semi final. 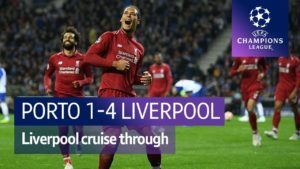 Liverpool's 18 minute first half burst of three goals gave the reds the advantage but that only serves to prove the inherent danger awaiting. Man City were denied the chance of winning the title against their derby rivals at the weekend and won't even countenance a third consecutive defeat. They have produced one of the most dominant English league campaigns in history and will be named title winners before the end of the month. 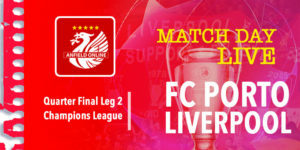 Both clubs are capable of scoring, and conceding, goals in number and in a short space of time so Liverpool will need to put in another impressive performance if we are to make it to the final 4 of Europe's top football competition. Five changes for the reds. With Jordan Henderson suspended - James Milner is captain. Mo Salah starts for Liverpool. 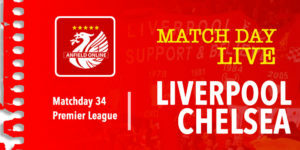 Liverpool team: Karius, Alexander-Arnold, Lovren, Van Dijk, Robertson, Wijnaldum, Milner, Oxlade-Chamberlain, Mane, Salah, Firmino. Substitutes: Mignolet, Klavan, Moreno, Clyne, Woodburn, Ings, Solanke. Aguero on the bench. Stering starts in this leg. Three at the back for City? Looks like Man City are opting for three at the back - with Otamendi in the middle and Laporte and Walker either side. Interesting tactics and a departure from City's normal system. All six of the officials tonight are from Spain. Let's hope that's not a good omen for Guardiola. And it's a boot in the ankle from Sadio Mane on Kevin de Bruyne. 1' Liverpool defend the free kick and it's back at the half way line. For the love of sweet jesus. 2' Van Dijk knocked off the field, Sterling lays it through to Jesus and they've got one back already! 6' Overhit pass by Wijnaldum. Salah isn't getting to that and it's back with the City keeper. 7' And now an overhit pass by Salah. Liverpool trying to build some stability after that poor mistake in the second minute. Roma have hit an early goal back against Barcelona as well. That tie is currently 2-4 on aggregate. 8' de Bruyne has a chance from outside the area. He fires it over the crossbar. 9' Liverpool corner.... would be great to get that goal now. It's a short one but Trent Alexander Arnold gets it in, but Lovren drags it over the touchline. 11' Good pressure from Sadio Mane who catches Kyle Walker in possession. City eventually get it away but de Bruyne drags the ball out of play. 14' Sadio Mane catches Otamendi in a 50/50 ball - but Ederson runs out and he's pushing Mane all over the pitch. Mane and Ederson both yellow carded. 16' Looks like Sterling was about to run the ball out but Lovren's fouled him unnecessarily there. Free kick in a dangerous position. Sane is in acres of space but he doesn't connect well with the shot. 19' Cross in for City. Robertson defends well, and now City have cut Liverpool open again and the reds are under the cosh. Liverpool stuck in their own half. 21' Here comes another corner for Man City - almost mid-way through the half and the reds are struggling a bit here. Cleared but only back out to City. 26' Mane and Salah have switched sides but there still not seeing much of the ball. Yet another City corner. Lovren heads clear. 27' de Bruyne with a low shot and Karius is down to stop it. 29' Another Liverpool name in the book. Trent Alexander-Arnold gets sold by Sane and drags him back. That's the fourth of the game. Bernando Silva for dissent. 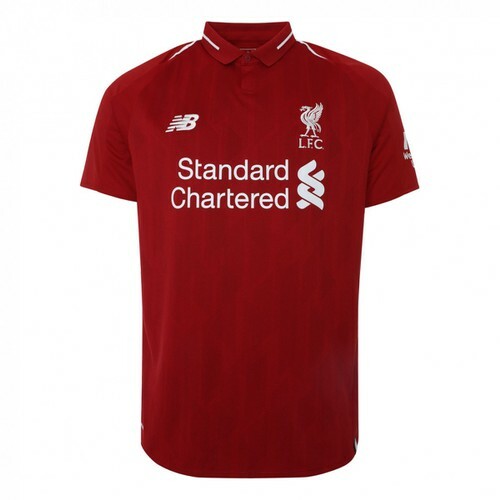 34' Liverpool with a corner. 35' de Bruyne was running away with the ball and Firmino clipped him. 39' Bernardo Silva with a shot that takes a deflection - another City corner. Van Dijk rises highest to head that away. 40' Oxlade-Chamberlain drills straight at the keeper though. Bernardo Silva rattles the post. Liverpool under the cosh again as half time approaches. Ball loops over and Sane gets the final touch. 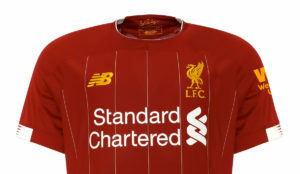 Liverpool exposed. 45' Liverpool cut City open there - combination of Firmino, Salah and Oxlade-Chamberlain but the chance is spurned. The angle was too tight for the Ox. And that's the half time whistle. Dismal half from Liverpool - not much attacking chances from the reds. He remonstrated with the referee at half time. We think it was related to the disallowed goal which looked like it took a touch off James Milner. Most first half passes for Liverpool? The keeper. City need two more unanswered goals to level the tie and on the basis of the first half they look to have that easily within them. Will the reds try and defend for 45 minutes or get a goal that would give them vital breathing space? 50' Been a quieter start to this second half. No real chances of note so far. 54' Overhit pass from Kyle Walker. A bit of steam gone out of City although they do have Aguero and a host of others on the bench who will surely be unleased soon. 56' Liverpool slice Man City apart, Mane looks like he's fouled in the area - no matter. 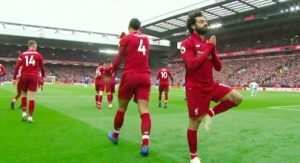 Mo Salah lifts it over Ederson!!!! 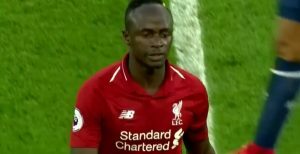 58' Sadio Mane accidentally drags the ball back for a corner. City don't do anything with it. Guardiola, sitting in the stands, slumps in his seat. Roma have scored a second. Barcelona now leading just 4-3 and Roma with the away goals. 61' de Bruyne limited to another long shot which is drilled straight at Karius. 63' Corner opportunity for Man City. Sane is over it..
.. it's way too deep but Otamendi drills it back in nicely but Karius is there once again. 66' van Dijk gets a yellow card because Sterling tried to kick him in the face. 69' Leroy Sane and Oxlade-Chamberlain collide accidentally after Chamberlain jumped for header. Both of them hobbling a little bit. 70' Laporte smashes one and it's deflected off Lovren's head and that nearly goes in - just over for a corner. 73' Man City have about 17 minutes to score four goals against Liverpool. The reds have been far better in this second half and can now taste the semi finals of the Champions League. 76' Very quiet in the Etihad now. They've given up booing our possession. The noise continues from the Liverpool end. 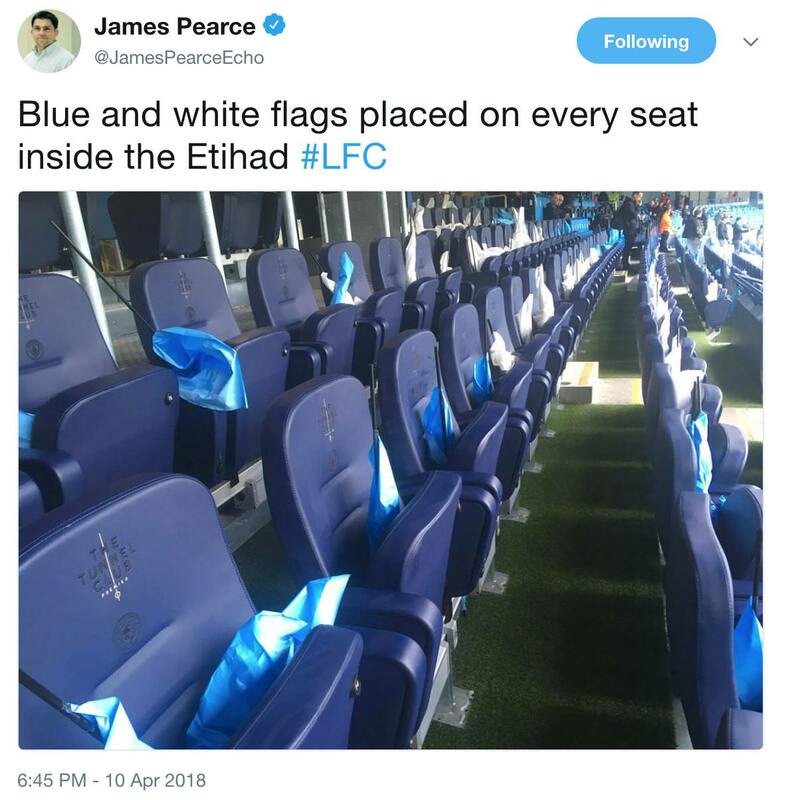 It'll be the Emptihad very soon we think. Firmino lashes it in - mistake by Otamendi and GOAL from Bobby Firmino. 80' Clyne and Klavan coming on for Liverpool. ...for Man City. Gundogan strays offside unnecessarily. All yellow cards are wiped ahead of the semi-final in case you are concerned about the few we've collected tonight. 87' Mo Salah goes off and on comes Danny Ings. LIVERPOOL ARE INTO THE SEMI FINALS!!!! Confirmation that Roma have knocked Barcelona out on away goals. They beat Coutinho's new side 3-0 on the night (4-4 aggregate). Very reminscent of the year Owen went to Real Madrid and Liverpool went on to win the Champions League in 2005? Is that an omen?